Manchester United striker Romelu Lukaku embraced Presnel Kimpembe after PSG crashed out of the Champions League at the Parc des Princes. The Red Devils progressed to the quarterfinals on away goals after a 3-1 win in France on Wednesday night, with Lukaku’s brace and a dramatic late Marcus Rashford penalty completing an unlikely comeback. Rashford’s chance to win the tie came in added time after Kimpembe was adjudged to have handled a Diogo Dalot shot in the area, following a controversial and lengthy VAR intervention. 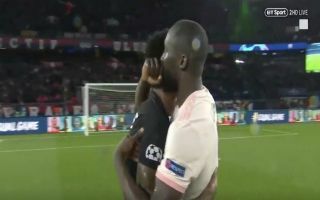 After the game, as his teammates celebrated a historic win, Lukaku consoled Kimpembe in a classy show of sportsmanship, sharing some comforting words with his opponent as PSG suffered yet another disappointing European exit. Check out a clip of Lukaku’s gesture below, via Twitter. Pure class from Romelu Lukaku to console a heartbroken Presnel Kimpembe while the rest of his team celebrate. ??? ?